This is Gunner, an Old English Bulldog from North Carolina. In case you’re wondering why his eyes are red, they were like that when his owner, Michael Batchelor, picked him up from his grooming appointment at his local PetSmart. Naturally horrified, he took Gunner straight to the vet. 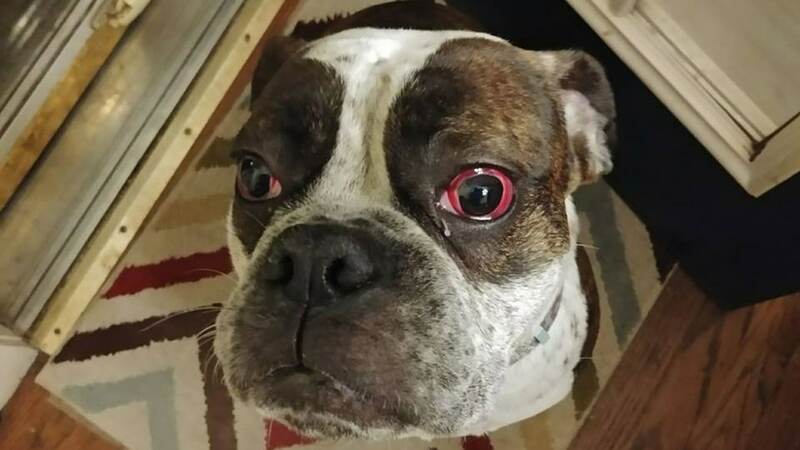 After ruling out an underlying medical issue in Gunner, the vet concluded that it was most likely the result of a subconjunctival hemorrhage – the causes of which can include anything from blunt trauma to the head to excessive choking of the leash. Given that Gunner’s eyes were fine before he arrived at PetSmart, and that Mr. Batchelor insists that they were red when he collected him, it’s by no means a wild leap of the imagination to suppose that something bad happened to Gunner during his grooming appointment. Naturally, PetSmart denied all knowledge and suggested that Michael himself was responsible for Gunner’s injury. They investigated themselves and found themselves completely innocent. How about that! Outraged, Mr. Gunner started a Facebook page called Justice For Gunner and other Fur Babies – and promptly went viral. So far the group has over 13,000 members and hundreds of people have shared very disturbing accounts of their experiences with PetSmart groomers, ranging from injury to death. We encourage you to scroll through the group’s history and see for yourself just how widespread the problem seems to be. While it must be stressed that some of these accusations are as of yet unproven (predictably, PetSmart does not monitor their grooming stations with cameras), the sheer volume is very worrying and will naturally be a cause for concern for any dog owners who use the service. PetSmart’s response to Michael’s allegation was to try to bribe him into silence. Naturally, they don’t want the bad publicity. Remind you of anything? We’ve already written about Wag, another corporate pet “care” company, and their attempts to bribe and threaten the owner of a dog lost by a Wag walker. PetSmart offered to pay Mr. Batchelor’s vet bill if he would refrain from sharing his experience on social media and sign an anti-disclosure statement. PetSmart called tonight and stated they would gladly pay my Vet fees if I would sign an anti-disclosure statement and remove my posts and retract anything I may have said. I am not doing that. These stories I have received are heartbreaking. In that case, PetSmart claim to have fired the groomer involved. But would they have done that in the absence of a viral video shared on social media? It seems unlikely. The groomer in that video is a fine example of a person who should never work with animals. It takes a special kind of patience to work with creatures who are nervous, hostile or stubborn in situations such as grooming appointments. And at the root of the whole problem is that animal welfare does not scale well to the corporate level. We’ve already written about the corporate dog walking service Wag! and its failure to establish the adequate safeguards and oversight required to ensure the safety of the animals it profits from. The trouble with pet care at places like PetSmart and services like Wag! is that oversight is heavily diluted through a chain of command via people who may or may not have animal welfare as their #1 priority. Instead, the priority is nothing more than a goal to get through as many appointments as possible to maximize profits. Shortcuts are made. Risks are taken. Employees are under pressure. Tempers flare. And of course when something goes wrong, the blame is diluted through the same chain of command. Everyone has each other’s backs. Lawyers are on standby. Public relations experts are there to minimize the damage to their reputation. Scandals are absorbed and forgotten about. Like the time a Petsmart groomer was arrested after a dog in his care died with horrific injuries just 3 minutes into a grooming session. One thing is clear – an awful lot of dogs are coming out of these grooming appointments with injuries, or worse still, not coming out of them at all. It shouldn’t be this way – imagine if this many people were dying in hair salons! We hope the experiences of people like Gunner’s owner, and hundreds more besides, will convince people to spend a little more on a grooming appointment with an independent groomer or a small business with more oversight and a better attitude to animal welfare.